Labelled as everything from ‘celtic-punk’ to ‘gypsy-punk’ to ‘pirate-swing’ to ‘anarcho-circus-music’. They are all and none of these! North-Eastern American folk-punkers Mischief Brew celebrate their fifteen year landmark with the release of ‘This Is Not For Children’, their fourth studio album and their first on the world renowned Alternative Tentacles record label. Formed in 2000 out of the ashes of various deceased local punk bands in Philadelphia they have seemingly been on non-stop tour ever since. With a whole rack of albums, EP’s, compilation albums behind them Mischief Brew have moved away from the experimental sound of their early days and have developed into a mighty fine band that has the power to both entertain both yer body as well as influence yer mind. Written in a South Philly garage with three instruments, the occasional sound of acoustic guitar, violin, junk percussion and glockenspiel among others creep in but basically ‘This Is Not For Children’ sticks to the Mischief Brew game plan and comes out on top. Unlike many of their previous releases their are only ten tracks on this album but with it clocking in at forty minutes you get a more relaxed band who seem at ease with their sound. Unrushed even when whizzing through the punky album opener ‘Two Nickels’. They follow it up with ‘Bad Heart’ another punky number that takes them further away from that ‘folk-punk’ moniker but they keep one foot firmly in place. ‘Lancaster Avenue Blues’ tells of yuppie property developers renaming neighbourhoods to encourage gentrification. A catchy tune with laid back chugging guitar and fiddle. The anger in the song builds up as they defend their home. What seems to be a global phenomenon of the rich wanting to live and take over the areas where the working classes live…once they have stripped said area of anything that gave them a bit of notoriety or passion. This is something we know in London only too well. Legions of the middle class move on masse to an area effecting housing and rent prices forcing the poorer to leave. That theme is expanded on in the next song ‘City Of Black Fridays’ is a tribute to Philly’s heavily industrial past and working class history. Over five minutes long its an acoustic anthem that brings up various instruments as well as before mentioned glockenspiel. ‘Squatter Envy’ follows and wonders if we’re all jealous of the lifestyles of squatters. Hmmm not sure. It’s tongue in cheek sure but squatting should be a necessity not a lifestyle choice especially if you’re gonna boast about it to my face! It always seemed a bit perverse to me the amount of posh squatters in London. It is after all a lot more risky when you have no financial safety net. More than a faint nod towards the anarcho-punk musical scene of the 80’s here. ‘Danger: Falling Pianos’ starts a bit jazzy and is Mischief Brew from fifteen years ago. Next up is ode to their home region ‘O, Pennsyltucky!’ which was released as a single last year and was reviewed by us here so no need to repeat ourselves just click and read the review! A really great song and captures Mischief Brew at possibly their most accessible and possibly even their very best. And that in a nutshell is the album. Yeah their home town ain’t all that great but it is home. Warts and all. Just because the road to a more faire and equal society is not an easy one is no reason to give up. We’re here for the long haul and if you can’t take a couple of setbacks then maybe you were just faking it all along like we always thought. 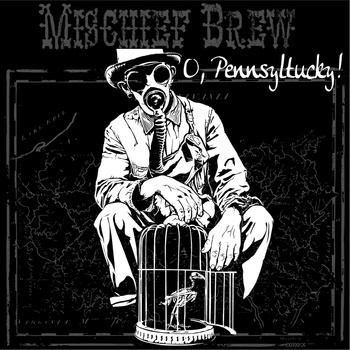 Mischief Brew have the ability to take subjects like gentrification, workers’ rights, squatting, baseball, drinking, growing up and horror movies and mould them together and give them meaning in a way many bands cannot do. They are a band that wants more out of life than to just sell records they want to inspire you to action and they have the ability to do it in spades. Flea markets, junk shops, boxcars, records, cassettes, hot sauce, the hiss and crank sounds of travelling amusement rides, rusty old farm tools, whiskey, Halloween, cider, cinnamon, margaritas, and that campfire smell you can’t get out of your clothes. 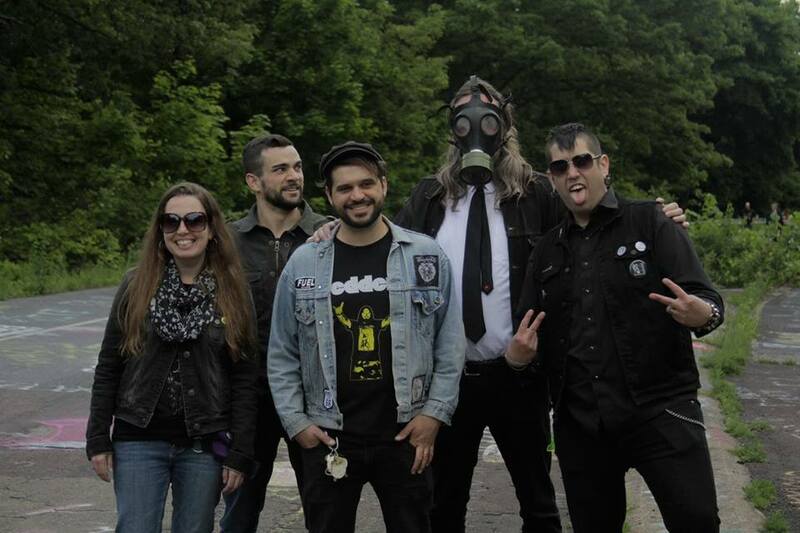 Formed out of the ashes of Philadelphia punk rock band The Orphans comes the prolific anarcho-folk-punkers Mischief Brew. Beginning with a scratchy old Demo tape back in 2000 they’ve gone on to produce a whole host of albums and EP’s. Numerous tours have taken them back and forth right across north America and they’ve even been to Europe and these shores a few times. Having always heard a fair amount about them but never actually hearing as much as a single song I took a chance and bought their new EP. Released a couple of weeks ago its dirt cheap like all their recordings and is pretty damn good too so I will certainly be going on to invest some of my hard earned into them. When I was a kid a mate lent me a Hawkwind album. To say I was impressed is a understatement so off I trotted to our local record shop grasping me pocket money with the intention of getting another Hawkwind disc. Imagine my horror when I get to the section with the H’s and found out that not only did they have their own section but it had about thirty albums in it. I decided there and then i couldn’t afford to be a Hawkwind fan so off I went to the S section and got me a Sham 69 album instead! I kind of get that feeling with Mischief Brew too. That getting into them may well bankrupt me but not just that. I’m so far behind that try as I will I wont ever catch them up!!! Rather that write out their full discography check it out here yourself and see what I mean. Must add at this point though that if you fancy the challenge the band have solid DIY roots and sell their music incredibly cheap. The EP ends with ‘”Dirty Overhauls’ a kinda-Woody Guthrie cover, rearranged by the band and then put back together. The punkiest of the the EP’s tracks but still with that unmistakeable folk twist and even a good bit of country thrown in and even more of Mischief Brew’s great lyrics. Well I am suitably impressed and already well on the road to bankruptcy with their ‘Songs From Under The Sink’ album just ordered! Three great tracks which stick closely to pretty much how I imagined they would sound despite all three tracks being musically quite different. The lyrics standout especially but overall a fantastic EP that should you invest in you’ll definitely want to hear more.